With the Christmas season rapidly approaching, I am reminded of ways to celebrate. Although I love Christmas poinsettias, holly berries and pine tree clippings, sometimes it is nice to have a change and feature a less traditional look for the holidays. The flower shops are full of options as are some of the markets this season. A few exotic flowers to spruce up the house during the holidays can bring a unique twist to your entertaining! This Christmas brunch table developed quite spontaneously when I was delivered a beautiful floral arrangement of stargazer lilies, carnations, and mums. To integrate this lovely surprise into our Christmas decor, I placed the arrangement on a basketry charger and wrapped greenery around the base to make a wreath then added dried pomegranates from our tree. 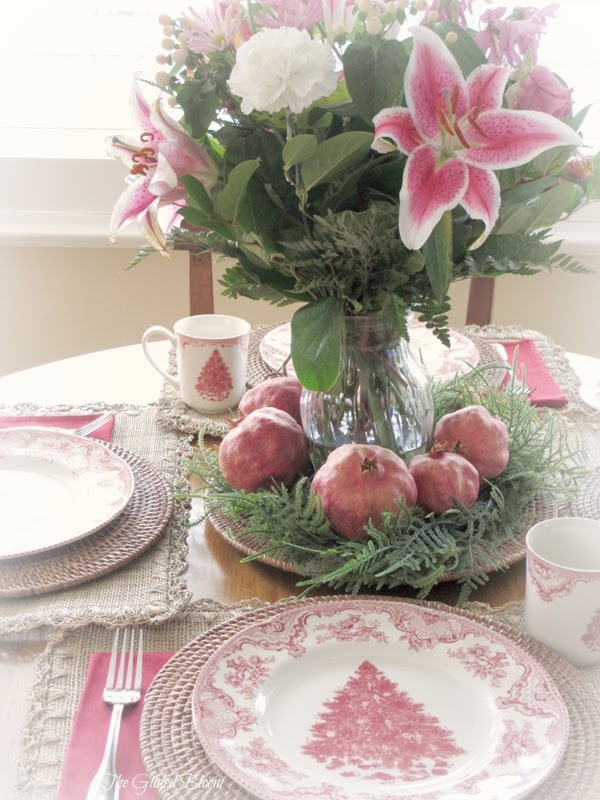 Red Christmas transferware seemed the perfect complement for this breakfast table ensemble! I began a collection of it a few years back and have been adding pieces ever since. Have you ever used exotic or tropical flowers in your holiday decor? HI Lisa - what a beautiful arrangement. I have never used tropical flowers at Christmas, but I am thinking about adding pomegranates to my Christmas wreath this year. I love your china - what is the pattern? Thank you, Julie. I've never used tropical flowers at Christmas before either, but the colors seemed to mesh with my transferware. I'm not sure what the pattern is called, but will check for you. I checked the transferware and it is made by Johnson Bros. England 1883. The pattern name is "Old Britain Castles". Surprising, as I thought it would have a Christmas title.